By Heidi Mochari, M.P.H., R.D. Coronary heart disease is the single leading killer of women in the United States, and women with diabetes are at particularly high risk. High blood glucose itself is believed to contribute to this increased risk, but diabetes is also associated with many other coronary heart disease risk factors, including abnormal cholesterol levels, high blood pressure, abdominal obesity, and blood that has an increased tendency to clot. Symptoms of coronary heart disease can include shortness of breath, nausea, clamminess, cold sweats, unexplained fatigue, palpitations, and chest pain. However, in many cases, coronary heart disease causes no symptoms. In fact, 64% of women who die suddenly of coronary heart disease have no previous symptoms. Unlike symptoms, however, risk factors for coronary heart disease are readily detectable and in many cases can be controlled. Because coronary heart disease is often fatal, it is essential to prevent it by knowing its risk factors, knowing which you have, and knowing how to lower your risk as much as possible. Coronary heart disease is a condition in which arteries supplying the heart become hardened and narrowed because of plaque buildup. The results of this narrowing and hardening can include myocardial ischemia (lack of oxygen to the heart due to reduced blood flow around the heart’s blood vessels), angina pectoris (chest pain due to myocardial ischemia), and myocardial infarction (heart attack). Some of the risk factors associated with the development and progression of coronary heart disease can be modified, and some cannot. Among those that cannot be modified are age, heredity, and ethnic or racial heritage. A woman’s risk for developing heart disease and for dying as a result of a heart attack increases as she ages. People whose parents had coronary heart disease are more likely to develop it themselves. And African-Americans, Mexican Americans, Native Americans, native Hawaiians, and some Asian Americans are at higher risk for coronary heart disease. High blood pressure. High blood pressure forces the heart to work harder and leads to thickening and stiffening of the heart itself. High blood pressure increases the risk of coronary heart disease, especially when other risk factors are present. Abnormal blood lipid levels. High low-density lipoprotein (LDL) cholesterol levels, low high-density lipoprotein (HDL) cholesterol levels, and high triglycerides are associated with increased risk of coronary heart disease. Obesity and overweight. People with excess body fat, especially if it is located around the waist, are more likely to develop coronary heart disease, even if they have no other risk factors. Additionally, excess weight can raise blood pressure, LDL cholesterol, and triglyceride levels, and it can lower HDL cholesterol levels. Smoking. A smoker’s risk of coronary heart disease is 2–4 times that of nonsmokers. Lack of physical activity. Regularly performing moderate to vigorous physical activity can help to prevent coronary heart disease by improving cholesterol levels and lowering blood glucose levels, body weight, and blood pressure. Some additional factors that may contribute to the risk of coronary heart disease include stress and excessive consumption of alcohol. Stress. Some scientists have noted a relationship between coronary heart disease risk and stress in a person’s life. It is not yet known whether stress has any direct, long-term effects on the heart or blood vessels, but stress is known to affect lifestyle habits in ways that can raise risk. For example, people who are under stress may smoke or eat more. Excessive consumption of alcohol. Drinking too much alcohol can raise blood pressure and may lead to heart failure or stroke. It can also raise triglyceride levels and contribute to obesity. Diabetes is considered a “coronary disease risk equivalent.” This means that people with diabetes have a similar risk for having a heart attack or dying of coronary heart disease as people who have already had a heart attack or been diagnosed with coronary heart disease. Therefore, prevention goals are similar for those with diabetes and for those with diagnosed coronary heart disease. In 2007, an expert panel for the American Heart Association in collaboration with other national health organizations updated the Evidence-Based Guidelines for Cardiovascular Disease Prevention in Women. These prevention guidelines apply to all types of cardiovascular disease, including coronary heart disease. They are based on evidence from clinical trials and were agreed on by a consensus of experts in the field. The table “Lowering Your Risk of Cardiovascular Disease” lists optimal goals for prevention of coronary heart disease in women at high risk as described in these guidelines. The guidelines underscore that women with diabetes are considered to be at high risk for the development of cardiovascular disease. These recommendations are consistent with the American Diabetes Association’s Standards of Medical Care in Diabetes. Aspirin. Aspirin therapy (75–325 milligrams) or the equivalent (if aspirin is not tolerated) is recommended for women at high risk of coronary heart disease. However, individuals should not start taking aspirin without speaking with their health-care provider first. Beta-blockers. According to the guidelines, this class of blood-pressure-lowering drugs should be used by all women who have had a heart attack or who have chronic ischemic conditions (restricted blood flow to the heart). ACE inhibitors. This class of blood-pressure-lowering drugs should be used by all women at high risk. If ACE inhibitors are not tolerated, another class of drugs called ARBs should be considered. The American Heart Association does not currently recommend using vitamin, mineral, or herbal supplements to treat or prevent heart disease and stroke. Not only are no supplements proven safe and effective for this use, but some are known to have an effect on blood clotting and heart rate or to interact with the effects of certain drugs. To avoid developing nutrient deficiencies, the American Heart Association recommends eating a variety of foods that includes five or more servings of fruits and vegetables per day. If you are considering supplement use for any medical or health-related reason, you should discuss the potential risks and benefits with your physician before starting it. Your doctor may want to monitor you regularly for any adverse effects. The guidelines for cardiovascular disease prevention recommend that cardiovascular risk factors be assessed at least annually to identify the presence of coronary heart disease in women with diabetes. They also recommend that people with diabetes be screened for the presence of micro- or macroalbuminuria, or the presence of albumin (a blood protein) in the urine. Albuminuria is a sign of nephropathy, or kidney disease. It is also associated with a higher risk of cardiovascular disease. Your physician may also recommend certain diagnostic tests to assess your heart function. A stress test (also often called a treadmill test or an exercise test) is used by a physician to assess how well a person’s heart handles work. During the test, the person is hooked up to a heart monitor and is asked to walk on a treadmill at varying speeds. The heart monitor generates an electrocardiogram, or a graphic representation of the electrical impulses in the heart. As a person walks, his heart rate, blood pressure, electrocardiogram, and how he feels are monitored. People with diabetes who experience typical or atypical cardiac symptoms or have had an abnormal resting electrocardiogram may be advised to have a stress test for diagnostic purposes. Additionally, people with diabetes who have a history of peripheral or carotid occlusive disease (clogged arteries in the limbs or neck); are older than 35, have a sedentary lifestyle, and plan to begin a vigorous exercise program; or have two or more major coronary heart disease risk factors may be advised to have a stress test for screening purposes. A heart attack occurs when the blood flow to your heart is reduced or blocked. Oxygen is unable to reach the heart muscle, and a part of the heart muscle dies. It is important to know that there is a wide range of severity for heart attack symptoms and that symptoms in women may be different from those in men. The classic symptoms of a heart attack include chest pain or discomfort, arm pain, and chest tightness. However, women are more likely to experience some lesser-known symptoms, which include back, neck, or jaw pain; abdominal discomfort; shortness of breath; sweating or light-headedness; indigestion or nausea; unexplained fatigue; inability to sleep; headache; and a feeling of impending doom. Because diabetes can affect nerve function, people with diabetes may have less pain with a heart attack or may experience a “silent” heart attack without the warning signs. By taking note of any signs or symptoms you do experience and seeking medical care immediately, you may be able to prevent damage to the heart muscle or even death associated with heart attack. Communication with your health-care provider is another key part of prevention. It may be helpful to keep a list of questions to bring with you to your physician visits. If your condition is particularly complex, it might also be helpful to bring a family member or friend with you to help to remember questions or to write down your physician’s responses. What are my cholesterol levels? Should I be taking any medicines such as statins, niacin, or fibrates in addition to working on nutrition and exercise? I know that my diabetes increases my risk of heart disease and stroke. Should I be on a statin or an ACE inhibitor to lower my risk? What is my blood pressure, and how can I reach and maintain a healthy level? What is my body-mass index (BMI), and what range is healthy for me? How can I find a dietitian to help me develop a good, long-term, weight-loss plan? How much physical activity is a good amount for me? How can I remember when to take my medicine? What should I do if I have any of the symptoms of a heart attack? Though the risk for heart disease is increased for people with diabetes in general, you can lower your personal risk by managing your risk factors. Most of the risk factors for heart disease are modifiable and can be improved through lifestyle changes and taking prescribed medicines as instructed. 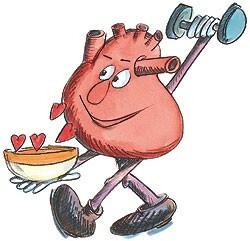 program’s Web site, www.HeartHealthTimes.com, has more information about heart disease prevention.